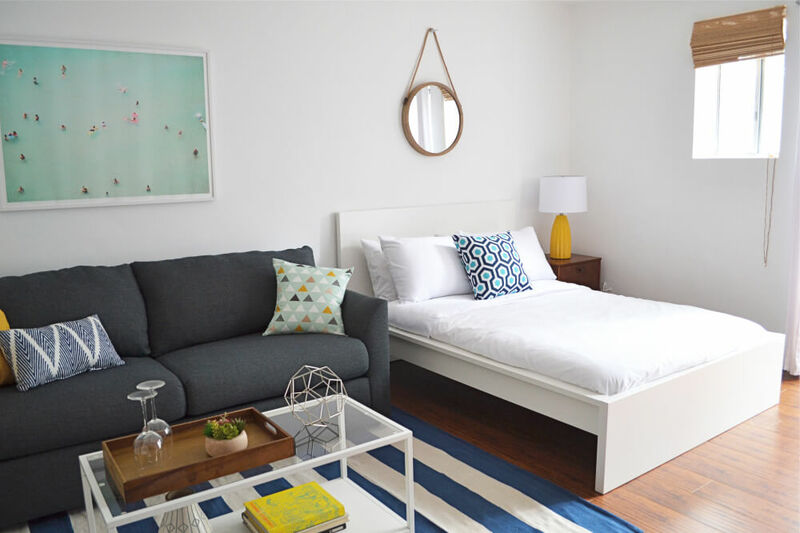 Thank you, Jenny Sanchez for this contribution of decor tips for AirBnB’s! I love Airbnb, I use it almost every time I take a trip out of town. The fun part is searching the listings and seeing what catches my eye. A listing doesn’t necessarily need to be my design style but I do look for a space that’s aesthetically pleasing as well as comfortable & clean. 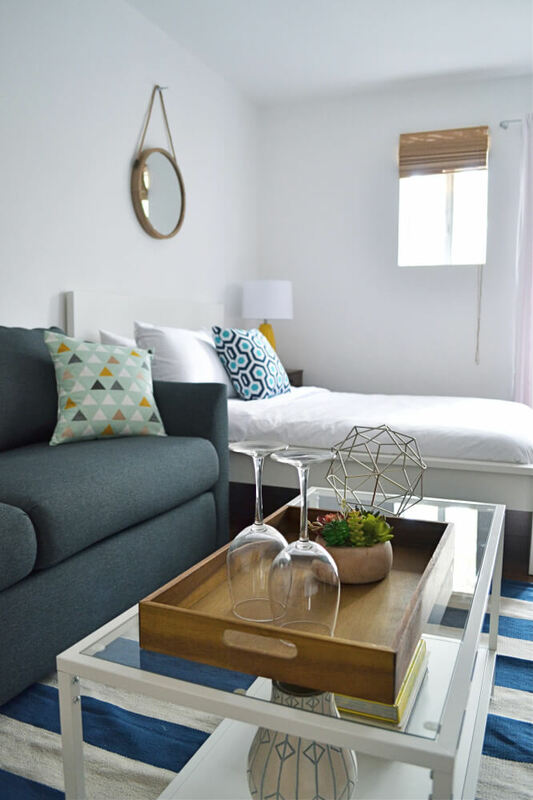 Sometimes just a few changes are all it takes to bring your space together and give it a cohesive look. 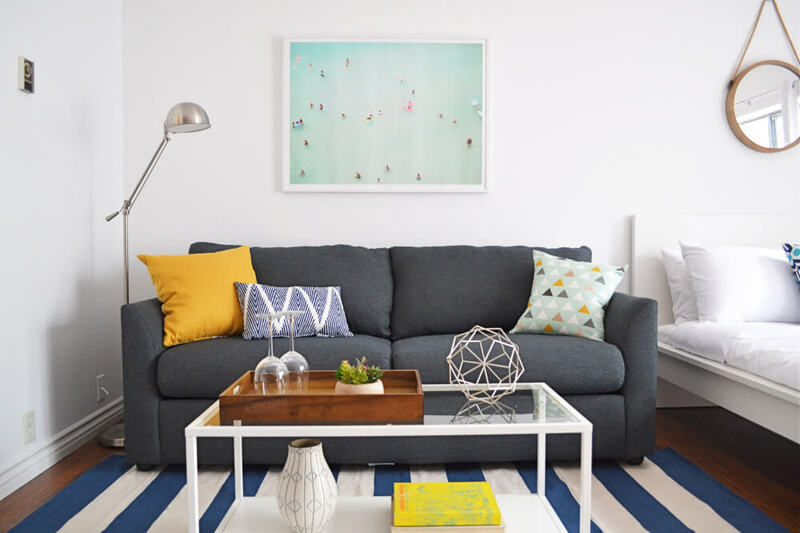 The following are some ways to add a decorative touch to your Airbnb and how to make it more appealing. Adding a rug under a bed or sofa grounds a room and designates zones. One mistake I often see is too small a rug. Generally, you want a rug under a bed or sofa to be a 5×7 or 8×10 (possibly larger depending on the room). Lighting is something that gets overlooked often. Good lighting can make or break a room. 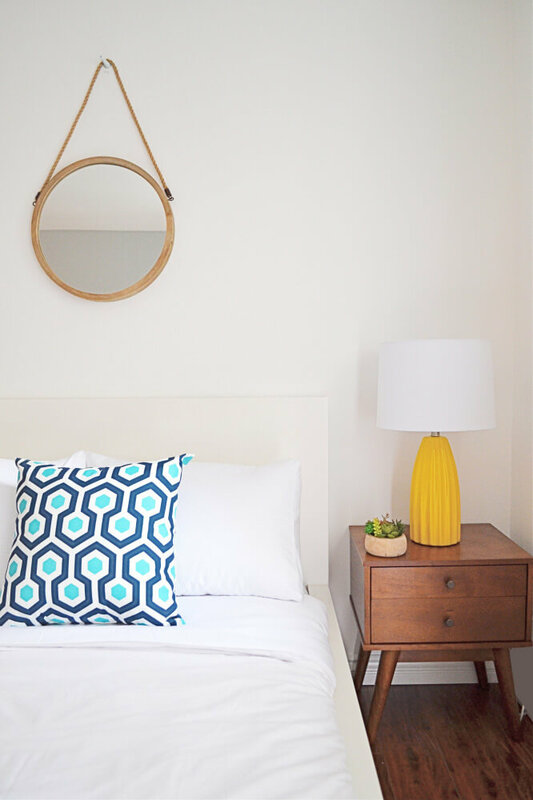 Try adding table lamps to bedside tables and living areas. A pendant light hung over a dining table adds a nice touch as well as practical lighting for guests. An easy way to decorate a coffee table is adding a stack of books. Try stacking three books together and placing a vase on top. I recently stayed in an Airbnb in Joshua Tree, Ca, and the host had books that were about the region. 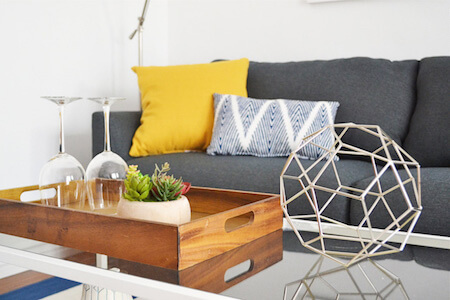 Adding a tray is another great way to display decorative objects and lends a more pulled together look. If you’re confused as to where to start with pillows my suggestion is ‘less is more’. Three decorative pillows are more than enough for a bed and up to 5 is plenty for a large sofa. Try mixing and matching patterns and pillow shapes and sizes. Stay within the same color palette of the corresponding pillows or take a note from the colors in the rug and/or art. Art doesn’t need to be pricey to make a statement. Ordering art online is easy these days. I adore companies like minted.com who have a huge selection of beautiful prints from real artists. They’ll even frame the print for you! Adding a mirror is an effective way to make a space feel more open. I like circular mirrors because they’re more pleasing to the eye and can break up a room that has too many rectangular shapes. Do you have a piece of furniture that has seen it’s better days? Try painting it. I recently had a project with a less than desirable metal coffee table. A quick coat of bronze-gold spray paint and the table ended up being my favorite piece in the room. I’m an online interior designer, that means I can design your space for a flat rate all via the internet!